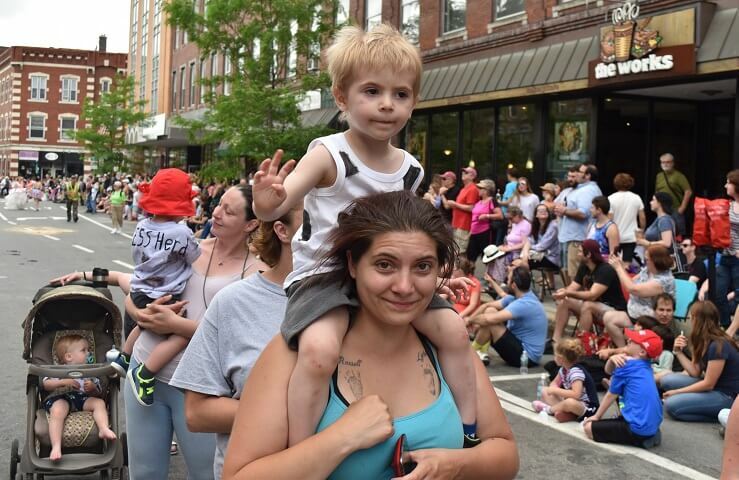 On Saturday, June 2, families and staff represented EES in the wildly popular Strolling of the Heifers parade in downtown Brattleboro. The Strolling of the Heifers, which began in 2002 as a small parade and festival that celebrated farmers and local food producers, is now a world famous parade, expo and street festival which draws thousands to the area each year for a fun weekend packed with things to do and learn. Video coverage from this year’s parade was fed from Brattleboro Community Television to Vermont Public Television and distributed to public television stations across the country! The EES crew had an impressive turnout, and we shone brightly with our passionate adults and adorable children. Bedecked in our brand new EES T-shirts, carrying signs, rocking a new EES banner, and of course leading a herd of kiddos in cow shirts, we meant business! We strolled ’til the cows came home (which was hopefully right after the parade, since they must have been tired from all that attention) and I am sure we turned a fair amount of heads. We would like to thank one of our EES teachers, Chelsey Johns, for all her hard work organizing EES’s participation in this event. Chelsey put a lot of time and effort into communicating with parade staff, creating flyers and other forms, organizing meetings, coordinating participants, obtaining and delivering materials, troubleshooting the shirt dyeing process, and being a dedicated leader in general. Thank you so much to all of our awesome EES families for joining us and showing your support of our program. Many of you came carrying or herding children or pushing strollers, you volunteered to hold signs or carry the banner, you dodged cow pies and you walked with us to the end! We very much appreciate your participation and truly couldn’t have done it without you!